Less $$$ to Spend: Escalating rates drain our pockets faster. “…Higher interest rates will cost Canadians roughly $8 billion more than they’re currently paying, or ½%-pt of disposable income,” CIBC estimates. For the average Canadian, losing 0.5% of their disposable income is like losing $200 of spending money each year. But that’s only the mortgage impact. Higher rates also mean higher costs for non-mortgage debt, like credit cards. The End of Rate Hikes: CIBC concludes, “…Both housing and consumption will no longer be able to carry the Canadian economy on their backs come 2020.” That implies a slowing economy in a few years, which in turn implies flat or easing interest rates. Of course, that statement is a shot in the dark. Canadian inflation can exceed forecasts with trade deals, rising commodity prices, unexpectedly and persistently high U.S. demand for our goods, fiscal stimulus (lower tax rates) and so on. More Refinances: There’s little question that demand for refinancing will increase as rates climb. But the ability to refinance will decrease—at least, the ability to refinance into a normal mortgage. More homeowners will feel stretched by mortgage payments at renewal. And more will need to restructure their debt to lower payments. Unfortunately, the government’s restrictive stress test will hinder those plans for at least 1 in 10 mortgagors, potentially 1 in 6 if past Bank of Canada data is a guide. The down side to these options is much higher interest costs. For example, credit union rates are 60-80 bps higher than normal uninsured rates for borrowers who can’t pass the federal stress test. But some borrowers will have no choice as rates march upwards. The higher rates go, the more people will feel the hurt. But it is that hurt that will limit how high rates go. 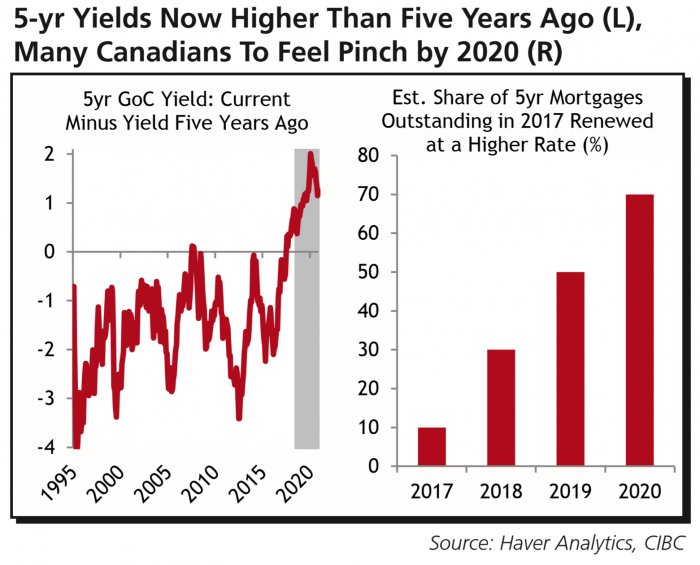 As someone who just renewed from a 5yr fixed into a 5yr variable, this reinforces the view I took that there’s only so much policy tightening that Canadian homeowners would only be able to absorb. I felt this would limit the number of rates hikes the BOC could implement over the next few years. Given the uncertainty with NAFTA on top of it, like the CIBC analysts noted, I think rate easing within the next two or three years certainly wouldn’t be out of the question. I’m in exactly the same situation as Michael as I have now renewed into the 5 year variable. I too can’t see the BOC raising too many times without crushing the homeowner. The government couldn’t care less about the homeowner. They have been warning them about debt stupidity since Jim Flaherty. They only care about currency and yields. As for the homeowner all you will likely get is a well deserved I told you so. Rates have been going up for over a year and its only just begun. They are going MUCH higher for years to come. The flaw in your argument is that most homeowners are not “stupid” about debt. Yet they’re being forced to pay a higher price for debt because of the Liberal’s response to the actions of a few. That makes no economic sense, no matter how you or they spin it. P.S. You have no more idea of where rates are going than my Chia Pet.